I’m back with the first revised post in The Path to Publication series. This series will detail the steps from pre-outlining and beyond to get you to a place where you have a publishable novel. It will be a weekly series, and I’m excited to see how it goes. I hope you all find these tips and tricks as helpful as I have. Today’s topic is pre outlining, a subject that I have already talked about, but today I’m going to get more in depth. My pre outlining is quite extensive, so I’ve chosen to break it into two posts. The next one should be out next Friday. Pre outlining is usually the first step I take after I’ve picked out my next novel idea and let it simmer in my brain. Even if you don’t outline, pre outlining can still be a helpful step so that you have a slight idea of what you’re going to write before you actually start your first draft. The first thing I do when I pre outline is write down all of the things that I know will happen in my book. It’s usually about four or five pages of scenes and major events that will take place in my book. The reason this is helpful is that it puts all of the ideas for your book in one spot, and gives you a good idea of where to go from there. 1. Alice has a strained relationship with about everyone in her kingdom, including her parents, the king and queen, because of the tragic accident she caused that killed her beloved older sister, Victoria. But you can format them however you want, this is just what worked for me. Next I take a highlighter and highlight all parts of ideas, characters, or settings that need more fleshing out. This helps develop your story and fill in some of the plot holes, and gives you things to brainstorm. For instance, one of the things I had to flesh out was the mid-point of my story, which I will talk more in-depth about soon. Then I make a list of all the highlighted ideas, characters, and settings, and brainstorm each one. I write down whatever comes to mind, whether it be brilliant or kind of silly. I start with writing out what specifically I want to brainstorm. For example, for the mid-point I wrote out that I knew I wanted to have an epic battle on one of the estates, and that there were specific secrets I wanted revealed, and I knew that there were a couple specific characters that I needed to die for thematic impact and for the story’s greater good in general, but I wasn’t quite sure how to get there. So what I do next is just write all the ideas that come to mind to untangle that great mess, and when I finally come up with a proper solution, I write it out neatly so I can come back to it later and understand my notes. That is all for today, come back next Friday for the second part of my pre outlining process which includes figuring out my plot points and creating a story timeline (an outline for my outline.) Leave a comment letting me know if you pre outline, and if any of these tips helped you. Thanks so much and sorry for the late post. So I’ve been gone for a while, because I’ve had school and I was in a play, which was a great time, but I’m back. And I’m going to be revisiting my old series Path To Publication very soon. So be on the look out for new posts every Saturday. Hey guys. I haven’t posted in a while. Things have been crazy. I’m moving, my grandpa died, I went on a vacation, and more. But I’m back and ready to get at it. Another reason I haven’t been posting much is because I had writer’s block. Yes. If you are a writer I’m sure those words send chills down your spine. Writer’s block is so well know that even most non writers have at least a vague idea of what that horror is. And us writers? Well most of us could tell you first hand about writer’s block. Almost every writer has, or will, at one point or another experience writer’s block. And we panic. What if this is the end? What if we never write another comprehensive sentence for the rest of our lives? The first step to obliterating writer’s block is to just calm down. It’s not the end of the world, even though it may seem like it. Remember, this happens to everyone. “But it doesn’t happen this extreme to most people!” you wail. Yes, it most likely does. You may feel like you are the only one with a writer’s block this bad, but that’s not true. Just remember, this happens to everyone. When you just can’t force yourself to sit down and write. You always come up with something else to do. You have no problem sitting down to write, the problem arrives when you do sit down to write. You don’t know what to do with your story next. You know what to do with your story, and you’re sitting down at your computer, ready and willing to write. But you just can’t find the words. You’re bored as you flounder around on your keyboard. You want to write, you know what to write, but you’re not motivated in another way, because you’re distracted by things going on in your personal life. This is the type of writer’s block I have been experiencing. There are many more types of writer’s block, but these are the only ones I have personally gone through and feel experienced enough to talk about. Also remember that your writer’s block could be a combination of any or all. Now that you have identified your writer’s block, you need to cure it. To completely cure it may take a while, but at least you can get started now. To cure laziness you just need to force yourself to write. And that may sound easy, but sometimes it’s not. And that’s why you may need to find a way to force yourself to write. One way is to set a word goal for the day/week/month, and if you don’t reach that goal you have to pay a friend or family member money, favors, or things. Another way is to keep a few writer’s magazines or books on hand, and read a page or two from one before starting to write. It will get you thinking about writing, and maybe even excited. This one is easy. You don’t know what you’re going to write next. Then plan. But maybe you don’t want to plan. Another way to cure cluelessness is free writing. Let yourself go crazy and don’t censor yourself. You’ll be surprised about what can happen when you just sit down and write whatever comes into your mind for fifteen or twenty minutes. If none of this helps, maybe you might have to start over, or take a brake and write something else. Listen to your gut, it’s usually right about these types of things. Maybe you need to throw your outline or plan to the curb, and just write what you think should happen, instead of what you planned. And remember, if you aren’t enjoying it, odds are your readers aren’t either. If that doesn’t work, maybe you should consider moving on to a different project and coming back to this later. Those are tips taken from my personal experiences. I hope they help as you too try to conquer that evil thing known as writer’s block. Wow I’ve been gone for a long time. I won’t go into a long, boring explanation of why I haven’t posted in a few months, but it involves a lot of sickness, the ER, and school finals. But I just finished my finals today, so I should have much more time to post. I’m super excited to get back into blogging, because I missed it a lot! I missed you guys a lot! So I thought I’d give you all an update on how my writing’s going. I just started outlining my new steampunk YA novel, and so far it’s been amazing! I’m using the technique taught in K.M. Weiland’s Outlining Your Novel book and workbook, and in her Structuring Your Novel book and workbook. I am stunned, shocked even, by how much her advice has helped my outlining process. So if you all are outliners, or even pantsers, I defiantly recommend you check this out. It is a game changer! I’m not gonna tell you guys much about what my new novel is about, just that it involves dead sisters, strong best friendships, working against slavery, and inventing robots. And here is my (kind of depressing) review of Red Queen by Victoria Aveyard. I was super excited when Red Queen arrived in the mail. I may have been so excited I might have, ahem, hugged the book and squealed very loudly upon its arrival. Just possibly. Sadly I was very, very disappointed. But first, COVER LOVE! The simplicity, the elegance, and the sort of tragic vibe coming from the blood dripping off a crown. That’s like my dream cover right there. It’s a very good-sized book, like 388 large pages. The hype for this book and the cover were my two main reasons for picking this book up. A lot of reviewers that I normally agree with raved about it, and I loved the cover so I ordered it. The premise? Meh. The only thing that interested me was why she had powers that she wasn’t supposed to have. The plot was slow going at first, with Mare and her family struggling to survive. Things pick up when Mare is actually taken to the palace and her powers are revealed but that’s around fifty pages in. I was interested after that point, but I wasn’t really invested. I didn’t really care what would happen to Mare because I didn’t care about her as a character. I didn’t really care about anyone else in the book either. I guess there was a sort of love square, but I didn’t like any of the three guys Mare was attracted to. They all annoyed me actually, and Mare annoyed me too. Cal was kind of blah, Maven was pretty creepy, and Kilorn was just there. I didn’t really feel like I knew anything about the characters. And I didn’t really get the romance either. Was it a kissing book, or wasn’t it? I almost DNFed several times throughout the book but kept on going to get to the plot twist. And I was so disappointed because I had seen that coming for at least fifty pages. I didn’t even like the plot twist very much. But hey, at least it added some action. So yeah, overall I didn’t really enjoy Red Queen. But, I may read the sequel when it comes out. I rate Red Queen two out of five stars. I’m back! 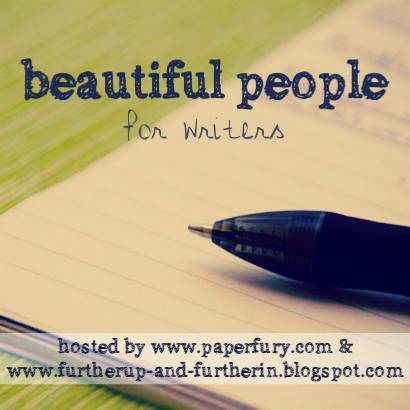 I’m finally better, and doing the Beautiful People (Author’s Edition) linkup hosted by Cait @ Paper Fury and Sky @ Further Up and Further In. I’ve been writing little stories ever since I learned how to scrawl down words on a piece of lined paper. The first book I ever finished was called James and the Big Blue Crain. It was for my brother James on his fourth birthday. I wrote it when I was five and I’m seriously thinking about publishing it. So I started when I was five. Which would make it about seven years ago. And I’ve been writing short stories and novels ever since. I started because I’ve always loved to read. After James and the Big Blue Crain, I took a break of about two years. Then I picked up Nancy Drew and loved the series. Then I learned that regular people publish books all the time. So the first thing I wrote for the intention of publishing was Me, April. I didn’t finish it, but I went on to write a mystery about April called April and Amy: First Case. I think it all started with April. I remember her fondly, but will never EVER try to get her published. The beginning of the whole process, when I come up with this idea, daydream about it nonstop, scribble down what ifs, and am sure THIS is the one that is going to be published. When a select group of people read the first chapter or two and beg to read more. When I’m done with the whole first draft. I JUST WROTE A NOVEL! When I’ve finished with editing. Does anyone really enjoy editing? When I’m done with anything and everything in the writing process. WRITING. As in the act of sitting down in a chair, turning on my laptop, calling up my writing software, and actually typing comprehensive words, sentences, and paragraphs. Editing. Ugh. Writing is nothing compared to actually editing. It lowers my self-confidence a lot. Making enough time to write and edit. I have a pretty busy schedule, what with school, music, blogging, and other activities. It’s really challenging to write, but I try to make the time. I used to be a total night owl, which annoyed my siblings to no end. Now I’m more of a morning person. My morning routine used to be I woke up at six every morning and wrote a thousand words in forty five minutes, then got ready for school. My schedule’s been a little messed up lately, but I’m trying to get back on track. b)	It’s a mess right now and it isn’t usually, so I’ll have to use my powers of description to give you an accurate picture. My writing space is a big L shaped cherry stained desk. My writing side is the smaller part against the wall. It has a nice nook for my NEW laptop *squee*, a bunch of shelves cluttered with my notebooks and writing books, and cupboards above for whatever I feel like putting in there. The longer side of the L is used for school, since I’m homeschooled I work there a lot. My last few have taken about three months, but my next two are probably going to take only a month each. (Fingers crossed!) But the one after that, a historical, should take a little longer, just because of research and such. So it really varies on what I’m writing. I only write one first draft at a time, but I can be editing or outlining another project while I write another first draft. It really depends on what projects I have. I like bittersweet endings. The main character has lost something important to gain what they were striving for. My next two novels are more sweet then bitter, but my historical novel is probably going to have the saddest ending I’ve ever written. But even that doesn’t compare to some of the endings in YA today. I think I was about ten when I discovered the magic of Percy Jackson. It was probably one of the first fantasies I read (up to that point I mostly read contemporaries and mysteries.) Percy Jackson introduced me to the wonderful world of fantasy, and from then on I started reading and writing a lot of fantasy. This is probably the most cliché answer of all time, but it’s true. Not so much her genre or plot, but her way of writing, the way it hooks you and engages you in the story, along with her superb world building and her way of weaving it all into an amazing story. This is one that I’m not sure how to put into words. It just touched me in a weird way, and I think it’s made my writing better. THE BOOK THIEF! It is probably one of the best books ever (everyone should read it). I wrote a review of it if you want my full opinion. 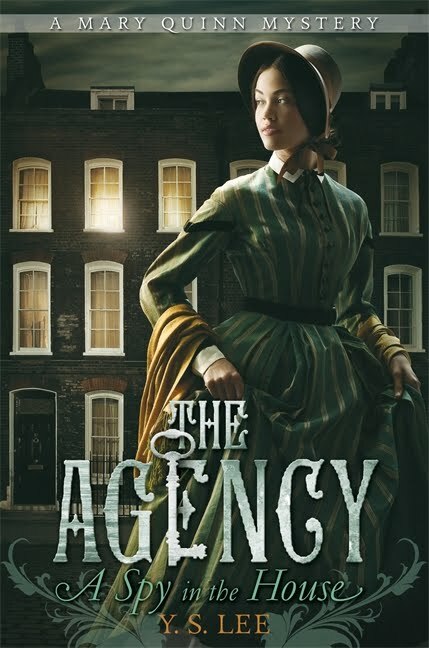 This was the first historical fiction book that truly engaged me, with characters and emotion. It moved me deeply. The Book Thief showed me that historical fiction can be just as entertaining as fantasy, or dystopian, or mysteries. Yes. It depends though. Sometimes I use it for bribery, as in I let my little sister read the next chapter in my dystopian and she does something for me. Other times I want people’s opinions. It really does just depend. WRITE. I’d rebel. And write. But I would still book blog (Is that a job? ), and possibly become a librarian or bookstore owner. A mystery novel. Mysteries shaped part of my childhood, and I think it would be cool to write one. I have tried, and even completed a MG mystery. (I had a BLAST writing it!) But I don’t think I’m ready to work on a full length mystery novel. If you all want me to post my short story here, just comment below. I’m sick. Yay. I’m taking a sick break today, because my brain is mush. I should be back Wednesday. Hopefully. Hi everybody! I say this tentatively…but this might be the last post in this series. We’ll see. I hope you’ve enjoyed it! One of my favorite things to do is to connect songs with characters from books, movies, and TV shows I like. I enjoy having context for a song, and finding the perfect one for a character. You could try doing this with your own characters. Listen to some music, and look up the lyrics if you need too. Music adds a whole other dimension to writing and characters, and it can really make you feel more for the people you are writing about. You could also do it the other way around. Find an interesting song, and see if you can make up a character for it. Try to be specific. For example, one character from a Rick Riordan book fits well with the chorus of “Try” by Pink (Where there is desire there is gonna be a flame, where there is a flame someone’s bound to get burned, but just because you’re burned doesn’t mean you’re gonna die, you’ve gotta get up and try, try, try). This connection works because the character is “fireproof” so to speak; he can produce fire and it won’t hurt him. He’s had a hard childhood too, so some fans of the book imagine his mom singing this to him, encouraging him to keep going. See what I mean? The song doesn’t have to mean a literal flame, but it can be interpreted that way as an interesting trait for a character. See if you can use things like that, single words or phrases, to create a unique character. Some songs may even suggest a plot. I like songs that seem to tell a story through the lyrics, or that have “characters” of sorts. An example would be “Cinderella” by Steven Curtis Chapman. This song is also a good example of one that evokes emotion. I also know that some people have specific music they listen to while writing, for inspiration or background noise. I’ve never done this, but I know some people work better with music. I believe Elizabeth did a post here once about her novel’s playlist. I think this would be interesting to try, getting songs that match the themes or plot of the story. What about you? Do you match songs to characters? Has a song ever inspired you? It’s time for Top Ten Tuesdays, hosted by the Broke and the Bookish. Todays’ s topic is Top Ten Most Anticipated Novels of 2015! Okay, I really hate to admit this, but I have very little knowledge for what novels are coming out this year, so if you all could give me some recommendations in the comments that would be great. Okay, this sounds like and AWESOME book! Not only have I read so many rave reviews about it, I LOVE the cover and the premise. A retelling of Beauty and the Beast with a Faerie lord? YES PLEASE! I’ve read the first three in the series and I AM HOOKED. This is my favorite series, ever. Like seriously. THE BEST. And it left off on a cliffhanger. Kind of. It’s hard to explain without ruining the whole series. But yeah. Definitely want to read that one. RICK RIORDAN. Cue the freaking out of the fangirls and boys. Yeah. Norse gods, trolls, giants, RICK RIORDAN. Enough said. I love The Penderwicks series and I can’t wait for the next one. I’ve been reading them since I was younger, and I’m hooked. Now comes the request part. These are all of the books I am looking forward to reading in 2015. I NEED MORE! Please comment below with book recommendations for books that are coming out this year, and books that are already out. You can check my Book Review Requests to find out what I can and can’t read. I REALLY need more books. My Goodreads goal is to read 101 books this year, but idealisticly, I would like to read ten new books a month. I’m a super quick reader. I read The Book Thief in one evening. In like three hours. But guess how many books I’ve read so far this year? ONE. It’s incredibly sad. So please, just go to my Book Review Request page, see what I like to read, and comment here on what books you think I might enjoy. Thank you so much, and don’t forget to come back tomorrow for Katie’s fabulous what we can learn post. Some people wonder about the age group definitions for middle grade and young adult. Do some teens read MG? What about eleven year olds and YA? And what is this new tween category that people are talking about? The general age groups for middle grade is for eight (sometimes nine) to twelve-year olds, and young adult is twelve to sixteen (sometimes eighteen). There is also a new category in the works called “tween”. Some publishing houses even have a tween imprint. What are the age groups for the tween category? It is for the higher level of MG readers. Do some teens read middle grade? Some do, for different reasons. Certain teens might not like particularly gritty books that populate the YA shelves. Others might find that there are books in middle grade that could be shelved as YA. It really depends on the person. Same goes for eleven year olds. As YA books like The Hunger Games and Divergent are gaining popularity, more and more eleven year olds, and even ten-year olds are reading YA. Kids usually like to read about a MC a year or two older than them. 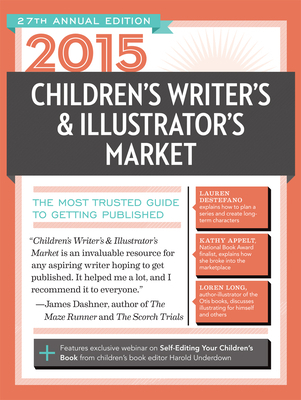 So how do you choose what the age group is for your book? If your book has a MC that is eight to fourteen, it could be in MG or the tween categories. If your book has a main character thirteen to nineteen, it would be in YA. That’s one way to figure it out. Another way is to look at the violence and romance in your book. In MG, there is little to none of that stuff, and if there is any, it isn’t extremely graphic. But in YA, it’s more acceptable. What age group do you prefer writing for and why? I can’t wait for this next week and the posts ahead. Thank you all so much for all of your support!